Stingless bees were collected throughout the state of Rondônia in the southwestern Brazilian Amazon for 1 year. The impact of agricultural colonization and subsequent deforestation on species composition and richness is explored. Deforestation, around each of 187 sample sites, was characterized at the mesoscale, microscale, and local spatial scale. At the microscale, deforestation was measured using a data layer generated by satellite remote sensing and analyzed with the assistance of a geographic information system. 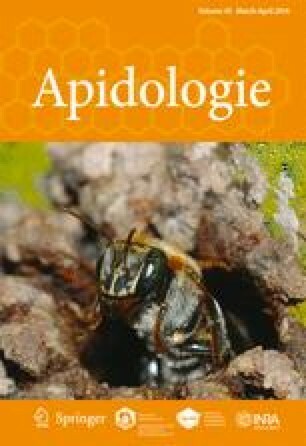 We report perhaps the greatest richness of stingless bees ever recorded in the Tropics, collecting 9,555 individuals from 98 species of stingless bees. Ten of these are new species and 16 were first-ever records for Rondônia. Five new species were scientifically described from the study. We report statistical relationships between deforestation and species richness at all spatial scales of analysis, and we tentatively identify species that appear to be especially sensitive to deforestation. The online version of this article (doi: 10.1007/s13592-013-0236-3) contains supplementary material, which is available to authorized users. The authors wish to thank Drs. João M. F. Camargo (in memoriam) and Sílvia R. M. Pedro for identification of the species, for their suggestions, and for their friendship; José Amilcar Tavares for his technical assistance with the collection; and Sandro Boina and José Aparecido Vieira for their field and laboratory assistance during the project. We also thank Denise Perpich who designed and managed the database of the project. We are grateful to Caio Márcio Vasconcellos Cordeiro de Almeida and Francisco Antônio Neto for providing laboratory space at our home base in Ouro Preto. The fieldwork for this study was funded by Tecnosolo and DHV Consultants, and it was conducted as part of the Second Approximation of the Socio-Economic–Ecological Zoning of the State of Rondônia. Additional funding was provided by the College of Liberal Arts and Sciences of the University of Kansas. Thanks as well to Chris Bishop, who helped construct the map and conduct the GIS-related analyses. We greatly appreciate the comments of the anonymous reviewers. All errors remain ours.